Retro jewellery also called cocktail jewellery generally covers the period from the late 1930s to the 1940s. 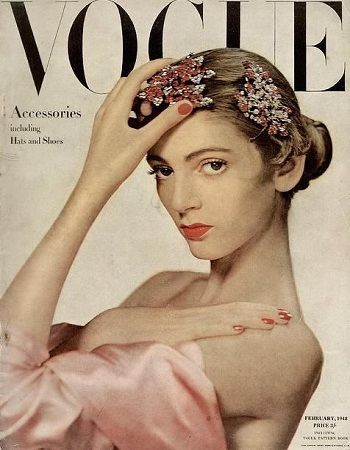 It was a period of jewellery history which was greatly influenced by world war II. Leading to large, bold and colourful statement pieces becoming popular. The war as can be imagined sent Europe into disarray. Jewellery manufacturing firms closed down and many designers left for America to find safety. Later in the period, this vacuum allowed American jewellery companies to gain market share in Europe. 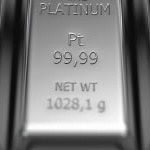 The war also affected the supply of platinum, leading to an increased use of gold. During this time more copper and other metals were added to gold in order to made it more affordable. This had the effect of changing the golds colour slightly. As a result, rose and green gold can be commonly seen in retro jewellery along with yellow gold. During the war years, remodelling of old jewellery was often the only way to get a new piece. If existing jewellery was to be remodelled in France at this time. Then it was normal to have a percentage of the gold content taken by the state for the war. Techniques were also developed such as the manufacturing of snake chain to make gold look chunky while using as little gold as possible. This snake chain or gas pipe as it is sometimes called was used in necklaces and bracelets throughout the 1940s. In keeping with this frugal theme, combinations of semi-precious gemstones were often set together without diamonds. The 1940s heralded the end of the Art Deco period. Which had dominated jewellery design for the previous 20 years. 1940`s jewellery designs shifted from that of straight minimalistic lines to a modernist style, which had elements of Victorian design. Flora and Fauna based forms were very popular. Textured metal design in the form of scrolls, fans, lacey and ribbons became common. The softening of geometric forms, which changed the concepts for jewellery design in this period. These were bold three-dimensional design with futuristic attributes. Due to the war effort, many of the materials used in the manufacturing of jewellery had to be diverted to the war effort. Platinum and base metal were unavailable. Gold was the metal of choice, although it had to be used sparingly as it was scarce, expensive and disposable income was small. Gold was made very thin and placed over another metal, such as Silver as in silver gilt or Vermeil (made by Tiffany’s), or it could be placed over brass. Rolled gold items were made using a method of rolling a base metal piece of jewellery in gold. They looked chunky and expensive but contained small amounts of gold. Gold alloys became popular where gold was mixed with other metal to create amalgams like rose or green gold, this was of lower gold content. An example of this would be 8ct gold, which was common during the war years. Silver was a metal which was used widely in this period. Palladium was another metal used in the period for jewellery production as an alternative to platinum. Costume jewellery also suffered as base metal was also scarce. The manufactures turned to plastics to fill the gap. Bakelite, Catalin and lucite were popular. 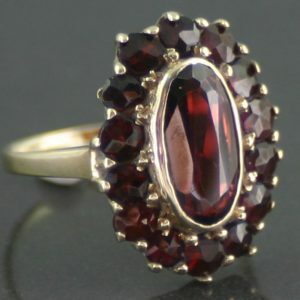 Precious gemstones became very rare in the period, due to the difficulty in procuring them during the war period. Semi-precious stones became popular. Aquamarines, Citrines, Peridots, Tourmalines and Amethysts. In large rectangular or square placed in bracelets of large setting rings known as cocktail rings. Necklaces were usually worn at the base of the neck. Enameled metal became popular as a substitute for gemstones to add colour to the jewellery. This was used in all ends of the price scale to add vibrancy to jewellery. Synthetic stones were also created in this period to reduce the cost of jewellery and as gemstones were difficult to source. Remodelling of old jewellery was also popular as in order to produce a new item of jewellery, jewellers often required the customer to find the materials. Gold was often more popular than currencies in this challenging period. The post-war period was a time of restructuring and renewal. The austerity continued but the mood was buoyant and jewellery became bolder and more confident in this period. 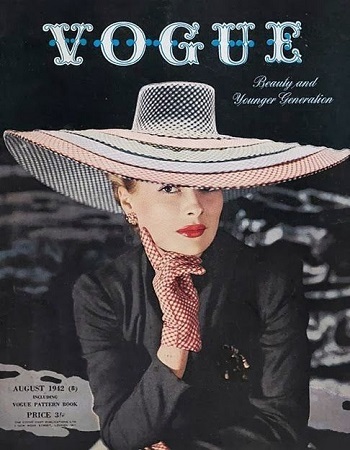 This is where the modernist style truly evolved into the mainstream. In this period fine jewellery producers consolidated their business, due partly to austerity and partly to the loss of skilled personnel to the war. Despite all this adversary they still produced fabulous statement pieces. 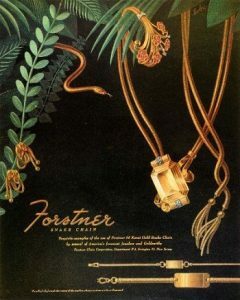 In Paris, Cartier produced many patriotic jewellery items. In order to show support for the Allied forces and it also showed the defiant spirit of the French people. The designs were of Red white and blue colours in the form of military symbols, like aeroplanes, eagles and flags. 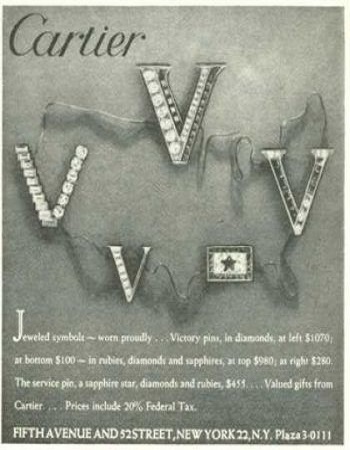 The letter v for victory was produced by Cartier towards the end of the war and worm as a pin to show allegiance. Due to a lack of precious gemstones the fine jewelers decided to focus on semi-precious gemstones, which were cheaper and much easier to access. Aquamarines, Amethysts, Citrines, Tourmalines, Garnets and Topaz in large rectangular and square stones. These were used in all forms of jewelry. Although there was always a demand for Diamonds and precious gemstones. Cocktail rings were popular as statement pieces, these were set in chunky gold and silver with the semi-precious gems. Rings were traditionally made of gold for wedding rings/engagement rings. As the decade progressed and the war ended, the changes which had occurred in society transferred into the production of jewellery, textured gold in the form of ribbons and bows. Wide bracelets and flexible bracelets were popular. Van Cleef and Arpels produced the Ludo Hexagone bracelet, produced in yellow gold in a honeycomb pattern. They became very popular and highly imitated, they were a highly inspirational as a development into bold three-dimensional design. Belt buckle rings and bracelets were popular, Tiffany and co. made a belt buckle bracelet in 1945 it was styled in a tile pattern indicative of the time, made in 14K rose gold. 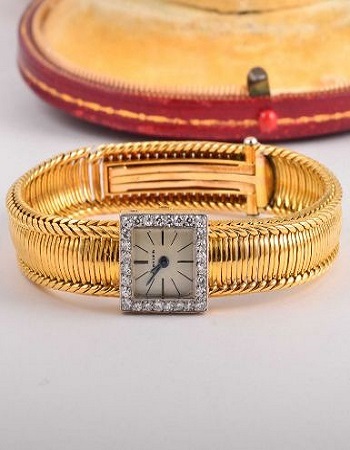 Tennis bracelets became popular in this period also as they used little gold and could be made with imitation gems. Charm bracelets also proved attractive as movement in jewellery became highly sought after, they provided the wearer with the ability to exercise their personal choice and character. Highly polished brightly coloured enamel also became popular as a means of adding colour to jewellery. Earrings came in the form of ear clips worn high on the ear. Vermeil gold or gilt silver, which was silver plated with gold became fashionable. This measure reduced the cost of the jewellery making it more affordable. In the 1930s America’s great depression was the defining force, and the 1940’s was a new awakening of creativity and progression. While the war practically ground Europe to a halt, America’s entrance was later and more contained. America was the new world where costume jewellery developed. When the Jewish people fled Europe to America, they brought their jewellery skills with little capital, creating an ideal environment for the creation of costume jewellery. Base metal became scarce as it was diverted to the war effort. They turned to the new plastics to fill the void. Bakelite was invented in 1907 It was the first synthetic plastic, lucite and Catalin were to follow. These early plastics created very unique jewellery in the day. They moved from gold to silver to reduce cost and open the market up to the general public. This made costume jewellery more accessible in stringent times. Trifari was a well known and high-end costume jeweller of this period. They created enamelled silver in flora forms in sets. They also created gold tone jewellery in different textures. In the 1940s Alfred Phillippe was the designer and he had worked for Van Cleef and Arpels developing the invisible stone setting. He brought this to Trifari, Coro craft was also a very recognisable costume jewellery producer in the 1940s. It had the largest manufacturing facility in the world based in Providence, Rhode Island. They also produced door knockers. During the war, they produced costume patriotic jewellery. The most well known of the patriotic jewellery of this time was MacArthur’s heart and key pin, which was on the cover of Life magazine in April 1941. Women used to give their jewellery to the war effort and wear the pin, as a show of support for their men on the front. Weiss jewellery was known for producing imitations of fine jewellery using imitations of gemstones and rhinestones. Miriam Haskell was a very productive manufacturer of costume jewellery. Her jewellery was of very high quality. With the use of layered texture and colour, they were consequently abstract in effect. They are highly prized in terms of collectable costume jewellery today. Beads were an inexpensive way of accentuating an outfit. These were made into bracelets and necklaces, usually using large beads. Felt flowers were used to brighten outfits. brooches inspired by fruit and veg. i.e cherries grapes and bananas made of early plastics. 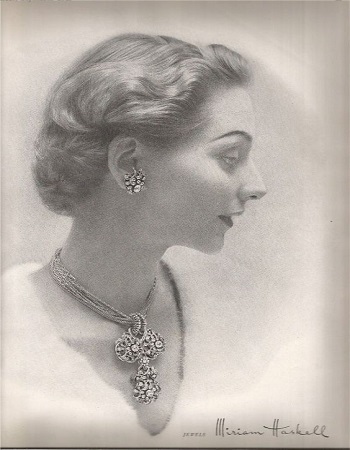 Pearl imitations were popular in single strands and multiple strand necklaces. Charm bracelets became very popular and were produced to suit every budget by using bass metal and silver. This was a changing era of consumerism and affordability. The new middle class became a larger group. Mass production was in its infancy. 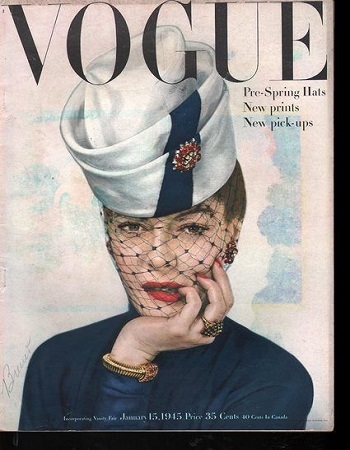 The iconic women of the 1940s were glamorous and distinctively fashionable. This was the era when every woman craved to emulate the image that their idol had created. Known as the golden age of Hollywood. Ingrid Bergman was the leading lady of this period. She starred in Gaslight in 1944, she made two films with Alfred Hitchcock, Spellbound in 1945 and Notorious in 1946, and of course the fabulous Casablanca in 1942. Dame Vera Lynn was a popular singer who preformed to the British troupes during the war. she was idolised by the ordinary British soldier. Rita Hayworth was an American forces pin-up girl, she was an actress. Her most famous film was Gilda in 1946. Where she played the Femme Fatal. Bette Grable was also a pin-up for the American GIs. She was employed in the 1940’s by 20th Century Fox for the film Down Argentina Way, in the 1940s. The Jewellery that each of these women wore were highly influential in the industry of jewellery production. To date antique or vintage jewellery it is best to start with the findings. The findings would typically be the pins, hinges and clasps that a jeweler will buy instead of making themselves. As these findings changed over the decades they have left us a timeline to follow. The findings are also the most obvious place to spot any repairs which may have being done over the years. After examining the findings the hallmarks should be carefully looked at. 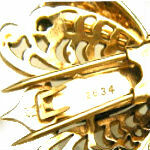 These hallmarks can tell us not only the metals purity but also the maker and sometimes the date of manufacture. The dominate themes of Retro jewellery are feminine, industrial and patriotic. The feminine styles would typically be represented by flowers, bows, ribbons, scrolls and birds. The industrial theme would normally be represented by tank tread bracelets, which have large repetitive links like tank tracks. These repetitive link chains also represented an industrial production line. Something a lot of people had to become familiar with due to the war. The patriotic theme of Retro jewellery was often represented by military type insignias such as the iconic US jeep. The trend in rings at this time was for large emerald cut semi-precious stones, such as citrines and aquamarines. Clip on earrings depicting floral bouquets, ribbons and buttons where very popular. 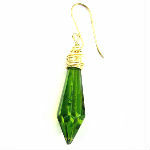 Emerald or step cut gemstones were also commonly used clip on earrings. 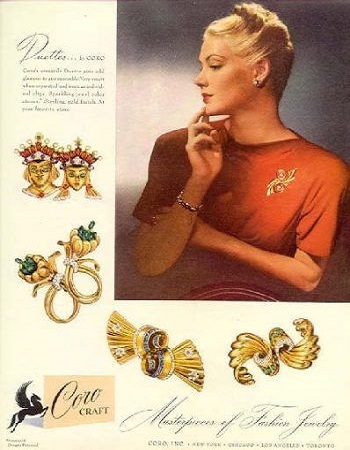 Ballerina brooches were a common sight in Retro jewellery. As were motifs of folded fabric, flowers, flowing ribbons and animals. Combinations of semi-precious gemstones dominate brooches of this period, providing that all important splash of colour. When it came to bracelets “the bigger the better” was the fashion of the day. Wide bracelets made from snake chain, bicycle chain and tank tracks were hugely popular. Woven and braided bracelets with large detachable brooches were also common at this time. Necklaces as with earrings and bracelets often had a convertible element to them. With pendants doubling as a brooch or a bracelet and earrings joining to form a bracelet. Snake chain and other repetitive link chains tended to be worn short, but with a chunky look. 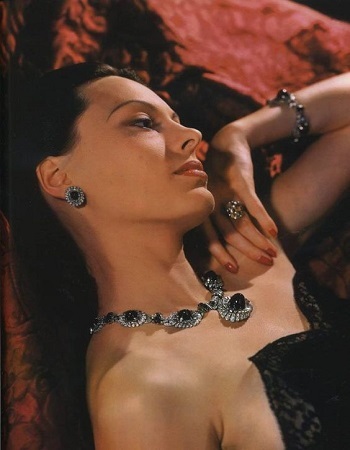 Bib necklaces were also a feature of Retro jewellery. Illustrated below are some of the important dates of Retro Jewellery. 1937 – Lucite introduced by Du Pont. 1939 – Double hinged fur clip invented. 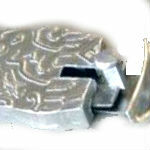 1940 – Tongue in groove box clasp. 1942 – Platinum prohibited for jewellery, sterling silver used to replace it. 1945 – Mexico requires “spread eagle” hallmark on sterling silver. 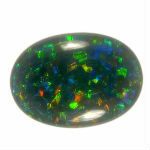 1946 – Opal doubles introduced. 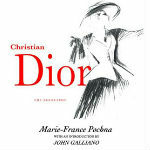 1947 – Christian Dior`s “New Look”. 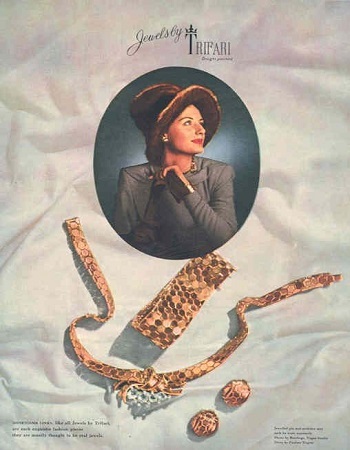 1947 – Costume jewellery manufacturer, Trifari hallmark .